Shweta Panchal is a Yoga Therapist for Mental Health. She is supervisor and a lecturer at the Minded Institute, an Active Birth Pregnancy Yoga Teacher, an Ambassador for the Pre and Postnatal Depression and Anxiety charity PANDAS, and is a member of the parliamentary group bringing yoga to the NHS. She has a first class honours degree in Psychology and Social Anthropology, and before becoming a full-time mother to her two boys, she had a successful eight-year career as a Management Consultant for the Business Consultancy, Accenture. 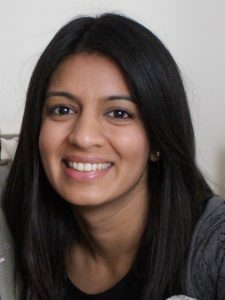 She provides business and organisational support to Minded and has spoken at parliament about strategies required to successfully integrate Yoga into the NHS. She is committed to integrating yoga with psychology for mental health issues related to infertility and perinatal mental health and also aspires to complete a doctorate in clinical psychology in the near future.